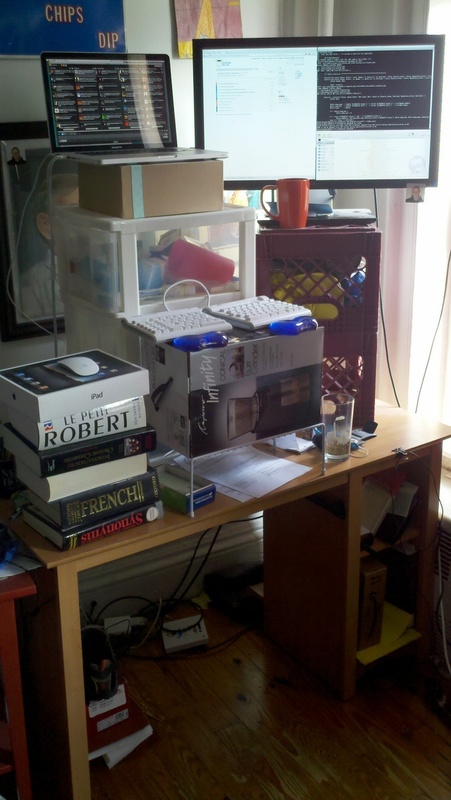 In the spring of 2011, I converted to a standing desk. At that time, I was unsure that I’d want to stick with the setup, and thus I didn’t want to spend the money on a proper standing setup. So my conversion to standing was effected by a motley collection of milk crates, thick books, and other implements of heightening culled from the corners of my apartment. More than half a year later, I’m still using and loving the standing desk, so I made the decision to get something a bit more permanent. “Proper” standing desks – those that are built for the purpose – tended, in my research, to fall short in a couple of ways. The first is cost. 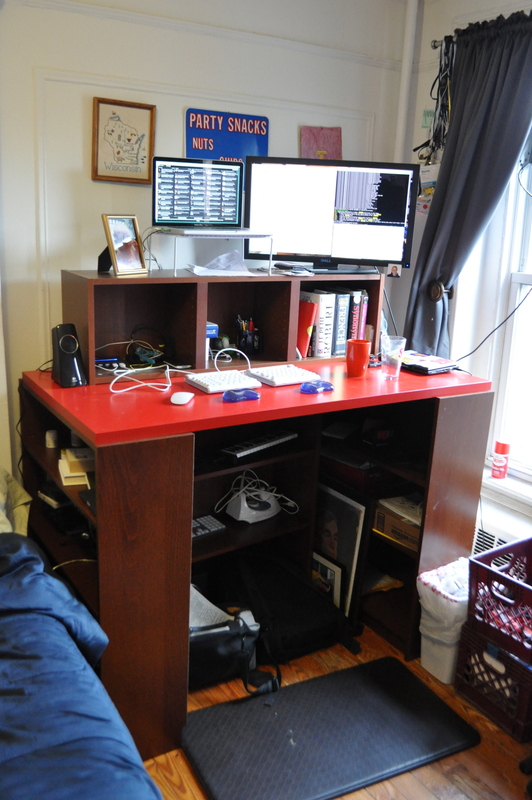 Decent standing desks seemed to start around four or five hundred bucks, and go (way) up from there. The vagaries of New York living mean that I didn’t want to lay out huge amounts of cash on something that might not fit in my next place. I wanted something cheaper. The second shortcoming of manufactured standing desks is size. It’s pretty easy to find what they call “workstations”, which have a surface of about two feet squared. My 27″ monitor by itself requires nearly that much space, and I wanted surface area for writing, a second computer, coffee, etc, yet full-size tables seemed pretty hard to find. Lame surface size is related to my third problem with existing standing desks, which is the paltry storage underneath. I wanted lots of it, and commercially produced standing desks seemed, at best, to dedicate vertical storage to a printer (BOOO PRINTERS). So I needed something fairly cheap, fairly big, and with a lot of storage underneath. A bit of trawling turned up this hack, which made a desk by combining a few different kinds of Ikea bookshelves. Unfortunately, that desk was too big for my space (I have about 66″ of horizontal space to deal with, and that setup requries a minimum of 73″). But it made me think I could do something similar using IKEA bookshelves. 3x BILLY bookcase – Two of these bookcases serve as the ends of the desk. Since I knew I’d have a bunch of additional space underneath, I bought a third, which is just slid underneath for extra storage. 1x VIKA AMON table top – They didn’t have this in the same wood tone of my BILLY bookcases, so I got bright red instead. 1x BILLY wall shelf – I needed something to raise my monitor and laptop up to eye level, and this gives me some nice desktop storage to boot. I couldn’t find something that spanned the full width of the table top, so I just centered this one, and used the extra space for speakers. Total cost for these pieces was, as of yesterday, about $230+tax. One of the big bonuses of using bookshelves as table legs is that I don’t need to worry about stability (like I would with regular table legs). The only fasteners I used were the four drywall screws I drove up through the bookshelves to keep the table top from sliding, and the two I drove down through the wall shelf to keep it in place. If you’re looking to do something like this yourself, make sure you think carefully about height. I chose this combination in large part because the resulting table height (about 43″) works for me: in bare feet, standing on my anti-fatigue mat, my elbows are at almost exactly a 90 degree angle while typing. I’m between 6’3″ and 6’4″, so your ideal desk height may vary. Date: January 9, 2012 · Author: Boone Gorges.